Intended for anyone who could be exposed to body fluids at work. Covers types of disease, infection risks, safe work practices, employer responsibilities, and more. 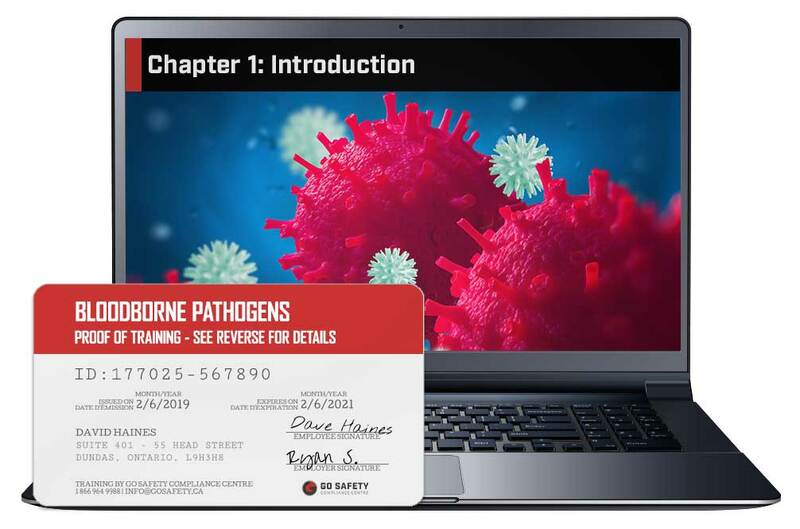 This online Bloodborne Pathogens course will guide you through all aspects of bloodborne pathogens, from types of diseases to protective measures. Our comprehensive course will explain in detail what you need to know, emphasize key points, and test your knowledge retention after each module. The course has been designed to meet industry standards and guidelines, so by completing the training, you can improve your knowledge of an often-overlooked part of workplace safety. Scotty P. Verified Buyer Very detailed and easy to understand. Highly informative. Toby K. Verified Buyer Quick, easy to use with excellent assistance from customer service. Cody H. Verified Buyer I found the web site easy to navigate, the accounts simple to set up and manage, and my people found the tests informative and easy to use. Dimitrios L. Verified Buyer It was easy and almost fun to fill out, not a bore. I would recommend this to all newcomers. Its clear and your own pace and success is inevitable. Kenneth M. Verified Buyer Easy to follow steps to get online course going, course was demonstrated in way to understand. Will use site again when required. Training can be completed in an hour and a half to two hours. Work at your own pace with no time limit. Immediately upon the successful completion of the final exam, a digital certificate will be issued. This certificate can be downloaded from your account and printed at your convenience. Sign your certificate. There is room on the back to document any additional workplace-specific training. A sturdy plastic Bloodborne Pathogen wallet card may also be ordered directly from your Go Safety account for an additional fee. These hard-copy certificates are printed on durable 0.30mm polycarbonate plastic. WHO NEEDS TO TAKE BLOODBORNE PATHOGEN TRAINING? Exposure to bloodborne pathogens can take many forms. This course is designed to inform and educate anyone who could suffer from potential bloodborne pathogen exposure: medical professionals, first responders, tattoo artists, body piercers, sanitation workers, housekeeping staff, and others. From needle sticks when cleaning up a contaminated worksite to dealing with human waste in a medical lab, the risk of exposure is wide-ranging and the potential for harm can be high. This course will teach you the basics that you need to keep yourself safe. WHAT TOPICS ARE COVERED IN THIS BLOODBORNE PATHOGEN COURSE? What is HIV/AIDS & Hepatitis B & C.
How can you be exposed to Bloodborne Pathogens? That depends on your job. Your employer is responsible for ensuring that you are fully trained in the safety procedures required for your employment. This may include additional practical training for handling and disposing of biohazardous waste, decontamination protocols, and how to use, maintain and store your personal protective equipment. HOW LONG WILL IT TAKE FOR ME TO COMPLETE THE BLOODBORNE PATHOGEN COURSE? Most students complete the course in about an hour and a half, but there is no time limit to finish your training. You can pause the program and pick up where you left off later. Take as long as you need. Once completed, the training material will continue to be accessible to you for review purposes. You can write the exam multiple times until you achieve the passing grade of 80%. WILL THE ONLINE BLOODBORNE PATHOGEN TRAINING WORK ON MY TABLET OR SMARTPHONE? HOW CAN I ACCESS MY BLOODBORNE PATHOGEN RECORD OF TRAINING? 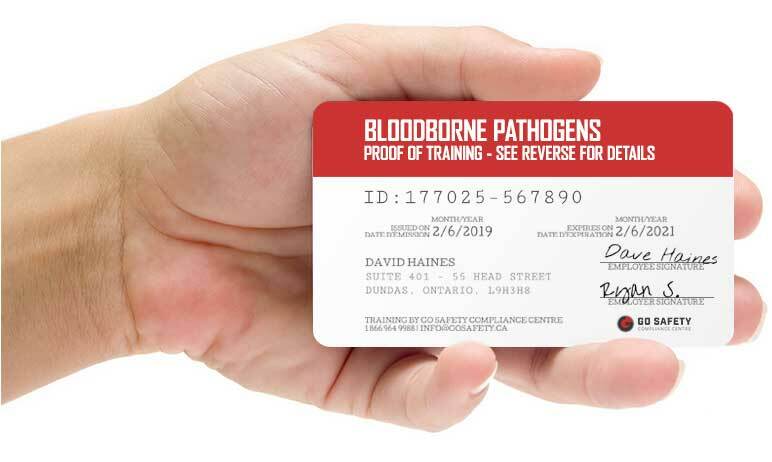 You can now purchase a wallet card version of your Bloodborne Pathogens training certificate online. Log into your account, go to Certifications, click then the green order button to the left of the certificate list. Select the course you would like to purchase the wallet card for and follow the prompts. WHAT HAPPENS IF I LOSE MY BLOODBORNE PATHOGEN CERTIFICATE? CAN I PURCHASE BLOODBORNE PATHOGEN TRAINING FOR SOMEONE ELSE?